For a recent holiday potluck, I decided to bring something a little different. With all these holiday dinners happening right after Thanksgiving, I'm pretty tired of the standard American holiday fare. I decided to make Momofuku's pork buns. If I can't be in New York, I'll bring New York to me! And who doesn't love pork? I knew if I could prepare it right, it'd be a crowd pleaser. And I aim to please. The recipe is shockingly simple--although it did require me to go to a couple different Asian markets to get all my ingredients. Basically, I just needed pork belly, steam buns, scallions, pickles and hoisin sauce. I decided to make my own pickles and also whipped up some Sriracha mayo. The house smelled like pickles for awhile, but it was so worth it. I hate jarred pickles but love homemade pickled cucumbers.Voila! Plan ahead, this recipe takes 2 days to prepare correctly. The pork belly is from the Momofuku cookbook and the pickled cucumbers is my adaption of the cookbook's vinegar pickled vegetables. 1. Mix together salt and sugar. 2. Coat the pork belly all over evenly with the mixture. Place in a container and cover. Keep in the refrigerator for at least 6 hours, but no longer than 24 hours. 3. Once marinated, pat the pork belly dry and place in an oven proof container, fat side up. 4. Roast at 375 F for 1 hour, basting halfway so the top gets a nice golden color. After the hour, lower temperature to 200 F and cook for approximately another hour. If the top gets too dark, cover loosely with foil. The meat should be soft and tender but not completely falling apart. 5. Allow to cool completely, placing in the refrigerator to chill once it's cool enough to handle. 6. Slice horizontally into 1/4 inch pieces. 7. Place in oven to heat before serving. 1. Heat all ingredients except the cucumbers in a pot of medium heat. Stir constantly until the sugar dissolves and the liquid comes to a boil. 2. Lower heat and add cucumbers. Cook for 2 minutes, making sure every piece is submerged in the liquid. 3. Pour into container to cool. 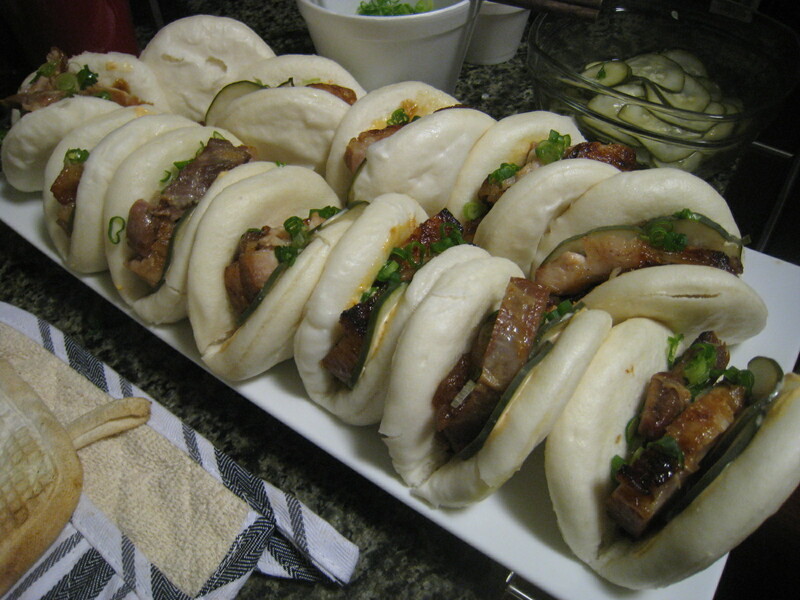 To assemble the bun, I steam the buns for about 5 minutes in a steamer (also works for 1-2 minutes in the microwave), slather on Sriracha mayo, hoisin sauce, then layer on pork belly, pickles and diced scallions. Repeat.